Nearly everyone shows some signs of wear and tear on the spinal discs as they age. Not everyone, however, will have symptoms described as degenerative disc disease. 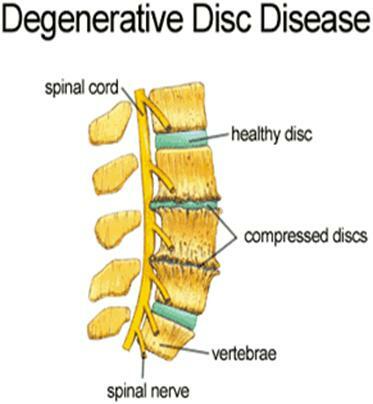 Not actually a disease, degenerative disc disease refers to a condition in which pain is caused from a damaged disc. A wide range of symptoms and severity is associated with this condition. A firm, tough outer layer (annulus fibrosus). The outer portion of this layer contains nerves. If the disc tears in this area, it can become quite painful. A soft, jelly-like core (nucleus puposus). This part of the disc contains proteins that can cause the tissues they touch to become swollen and tender. If these proteins leak out to the nerves of the outer layer of disc they can cause a great deal of pain. The bone where the injury occurred becomes relatively unstable. Over a long period of time, the patient will have back pain that comes and goes. The body restabilizes the injured segment of the back. The patient experiences fewer bouts of back pain. The X-ray below shows degenerated discs on the leftbefore surgery. 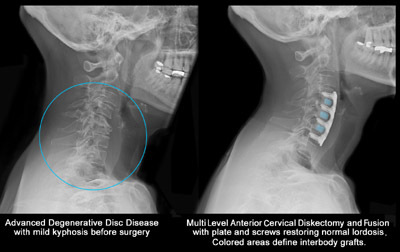 On the right is an X-ray of the discs after traditional spinal fusion surgery. Pain that is worse when sitting. While seated, the discs of the lower back have three times more load on them than when standing. Periods of severe pain that come and go. These last from a few days to a few months before getting better. They can range from nagging pain to severe, disabling pain. Daily activities and sports cause tears in the outer core of the disc. By the age of 60, most people have some degree of disc degeneration. Not everyone at that age has back pain, however. Injuries, which can cause swelling, soreness and instability. This can result in low back pain. A diagnosis is based on a medical history and a physical examination, as well as the symptoms and the circumstances where the pain started. Magnetic resonance imaging (MRI scan) can show damage to discs, but it alone cannot confirm degenerative disc disease.